Gorodki – an ancient Russian fun, which gradually supplanted other, more popular sports and computer games. Despite deep historical roots, standards for the game and its rules were invented only in the early 20th century. To win, a player must have a good physical form, good eye and, of course, a little luck. How to play skittles? Prepare equipment for playing skittles. Bat for strikes made of a few wooden churbachkov, connecting them together with metal plates. The easiest way to make bat – to cut with a hacksaw, of suitable length and diameter piece of polypropylene water pipes and tightly fill it with sand, closing the ends of the pipe stubs. Fabricate towns. 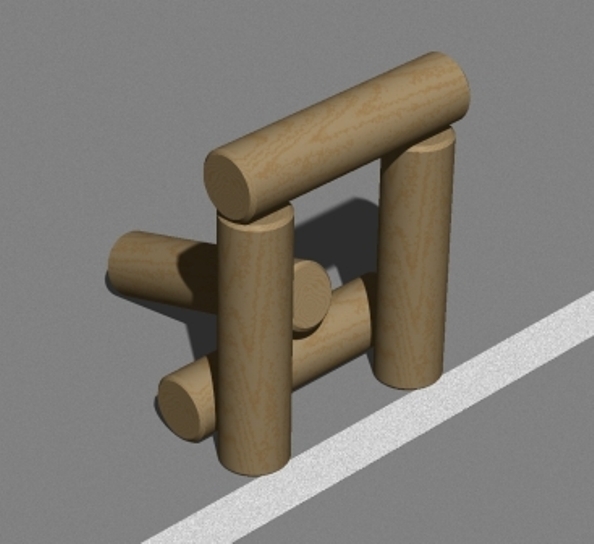 They represent a wooden cylinder with a length of 200 mm and a diameter of 50 mm. Minimum set for one player or five pieces. Towns easily you can carve on a lathe in the school workshop. Pick a field for city battles. The game will suit any large area with a hard surface such as asphalt. Using chalk, draw the square the size of two by two meters, it will be a standing figure. Note also the buffer zone at the front and sides of the square, beyond this zone will need to knock the skittles. Before a buffer zone, add a strip of sand width in meter. If the bit while throwing in touches this band, the cast will not be counted. Match the square shape of the towns and hit her with it. You have two attempts. The first shot is from a distance of 13 m from the square, the second with a 6.5 m Then comes the turn of the enemy to make their shots. There are fifteen standard shapes, but you can invent them yourself. The winner said the player who caused the greater number of pieces with the least number of throws.